One of our Federal Agency customers has a requirement for technical support to provide planning, installation, test, and checkout of enterprise information technology (EIT) infrastructure and systems support known as “IT Fit-Up” and to provide operations, maintenance and technical support of that EIT infrastructure, known as “Dual Ops.” The customer is renovating its existing facilities in several major phases and during IT Fit-Up, ActioNet will provide technical services for the planning, installation, test and checkout of EIT infrastructure and systems in the renovated spaces as each phase of construction is completed. During Dual Ops, ActioNet will provide technical services to the customer’s IT Directorate in support of the operations and maintenance of the EIT infrastructure and systems at all the sites supported by the IT Directorate. The scope of work includes Command, Control, Communications, Computers, Intelligence, Surveillance and Reconnaissance (C4ISR) engineering, installation and network support of Sensitive Compartmented Information Facilities (SCIFs) throughout the IT Directorate. ActioNet implemented its full Engineering and Installation lifecycle support for this project. Engineering Services – site and equipment surveys; technical performance specifications. Engineering Test and Evaluation – tests, checks, inspections, certifications and evaluations of equipment and systems. Installation Design – Base Electronic System Engineering Plan (BESEP) for planning shore electronic facilities. Installation Services – inside cable plant installation; power and electrical panels; cabinets and secure VTC for the data center and conference rooms; electronic communications equipment/systems including routers, switches, COMSEC equipment, desktops and servers. 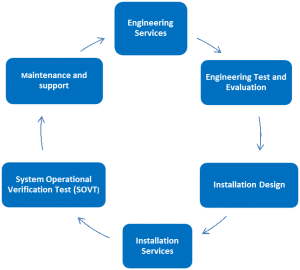 System Operation Verification and Test (SOVT) – SOVT on installed electronic and communications equipment; corrected all installation related deficiencies. Monitor, analyze, troubleshoot and/or evaluate hardware, software and other network and systems related problems. Perform general LAN/CAN/WAN administration, including integration, test, conversion and cutover of large-scale integrated networks. Organize, schedule and direct hardware installation, system conversions and cutover, including coordination and post-installation operations and maintenance (O&M) support. Responsible for monitoring, tracking and evaluating global IT infrastructure incidents. Oversee the network control center and oversee maintenance of associated systems. Coordinate with the site program managers, project managers, and responsible users and to ensure network operations and systems integrity and to provide overall network management and systems administration oversight. Manage IT systems infrastructure and associated processes. Provide support for the implementation, troubleshooting and maintenance of IT systems, including support for virtualization technologies used in the applications hosting environment (AHE). Analyze and develop new hardware requirements and prepare specifications for hardware acquisition. Direct and lead preparation of engineering plans, site technical design packages, and configuration changes. Serve as a focal point for all configuration management (CM) issues related to IT infrastructure, including CM planning, documentation, and change control. Support the government to define information systems security requirements and functionality. Implement IT systems security solutions by assisting with the planning, training, installation, and configuration of those systems. Produce formal and informal reports, briefings, and direct input regarding security and functionality requirements, system architecture, and security designs. Conduct risk assessments throughout the systems life-cycle and monitoring security relevant changes of IT systems.